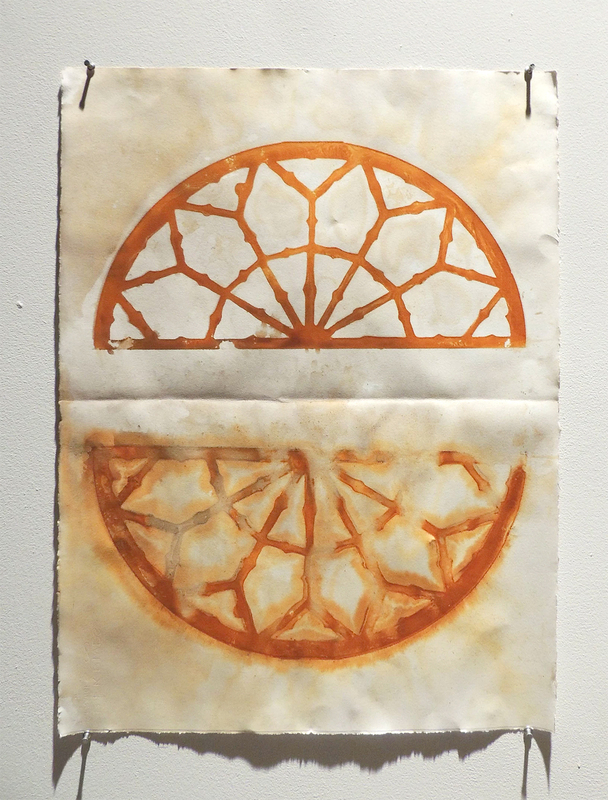 Expand your ideas about printmaking with found objects in a new weekend class taught by artist Lauren Koch: Traces of Beauty: Rust Printing. 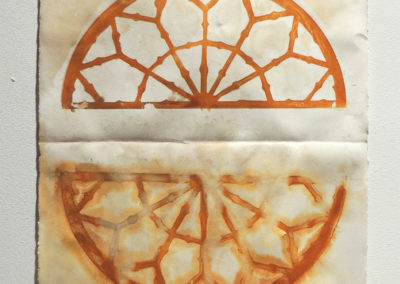 Rust printing is a unique way of mark making that utilizes steel and iron to create images on paper and cloth. 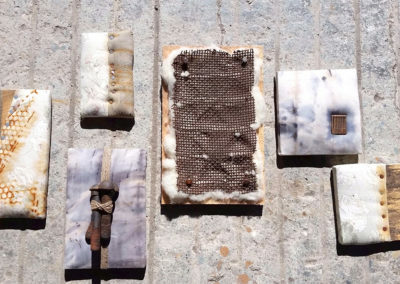 I recently talked to Lauren about her work, rust printing, and her relationship with the Folk School. Enjoy our interview! CP: How does your upbringing and sense of home influence your craft? Has craft always been part of your life? LK: I’m originally from Northwest Georgia, but most of my family is originally from the Athens, Georgia area. Throughout my life, I’ve seen it go from cow pastures, horse farms, and chicken farms, to subdivisions and shopping malls. I grew up around the quilts that my great grandmothers and great aunts had quilted using old clothes and flour sacks. With the help of my aunt and grandmother, I started learning to knit and crochet from a young age. I had a unique education situation, as I was homeschooled. While the curriculum was rigorous, it gave me the opportunity to either work ahead, or take my books with me when we would go on long family trips. I always wanted to go to museums, historic sites, pioneer days, reenactments, and arts & crafts festivals. You could either find me with the blacksmiths, textile artists, ceramists, or campfire cooks. Craft has been a huge part of my life. CP: When was the first time you came to the Folk School? What kept you coming back? LK: I remember hearing about the Folk School while I was in high school and wishing I lived closer. We often camped in the North Georgia mountains, so on one trip in the early 2000s, we finally visited the Murphy area and found Brasstown. From that time forward, all I could think of was taking a class at the Folk School as soon as I was old enough. Finally, in May of 2006, for my high school graduation trip, I took a mountain dulcimer class with Anne Lough. The community that has been built around the Folk School, and the friendliness of almost everyone I’ve met there, is truly the reason I keep coming back to the Folk School. In addition to that, I get to learn really cool things, and share experiences with really great people. CP: Are you currently in the graduate school? LK: Yes, I’m currently halfway through the three year MFA program at the University of Maryland. UMD was at the top of my list because of how interdisciplinary the program is. This was especially important to me, as I don’t like being limited since I am proficient in a vast array of techniques and I love to learn new processes and experiment with materials. CP: What do you like about teaching? LK: I love sharing my knowledge and watching students flourish. What keeps me coming back to teaching is when a student comes to me shy and nervous to discuss their ideas, not knowing if their idea can even become a reality, and then seeing their face light up as you start exposing them to other artists working with similar content and materials. Soon, they are laughing, smiling, and inspired to jump into their project. CP: What is rust printing? What draws you to rust as a print material? 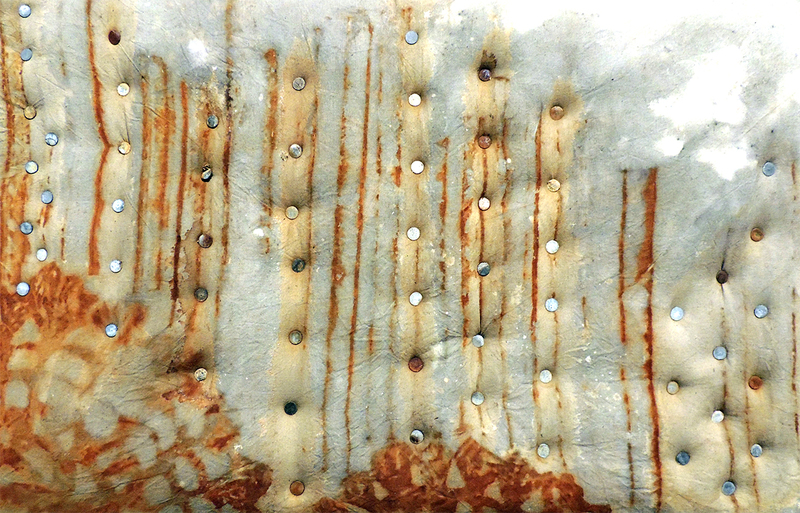 LK: Rust printing utilizes the natural oxidation process of ferrous metals to create marks on various substrates. In college, I was exposed to all of the traditional printmaking methods, but started experimenting with natural colorant options. 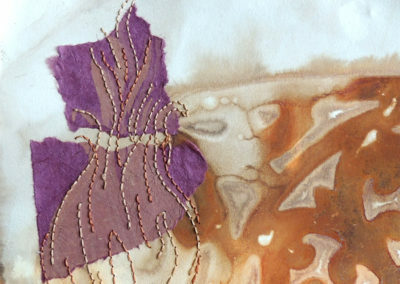 I started combining my knowledge of traditional dyeing processes, and use of metals as mordants to alter the colors as a basis for my practice. What draws me to this process is the lack of control I have over the results, in addition to knowing the rules of traditional printmaking and being able to break them. CP: What is your favorite thing about rust prints? LK: I have always felt the need for ultimate control in any situation, yet I long for disorder and the unknown. Rust printing in combination with traditional printmaking, painting, and drawing techniques, allows me to explore both constraint and chaos, simultaneously. I intentionally choose the form or the placement of ferrous metals for my prints. 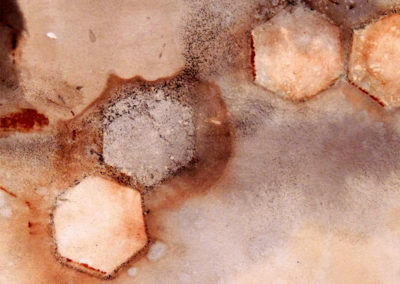 The nature of oxidation and variable atmospheric conditions effect each piece uniquely, creating unexpected results. 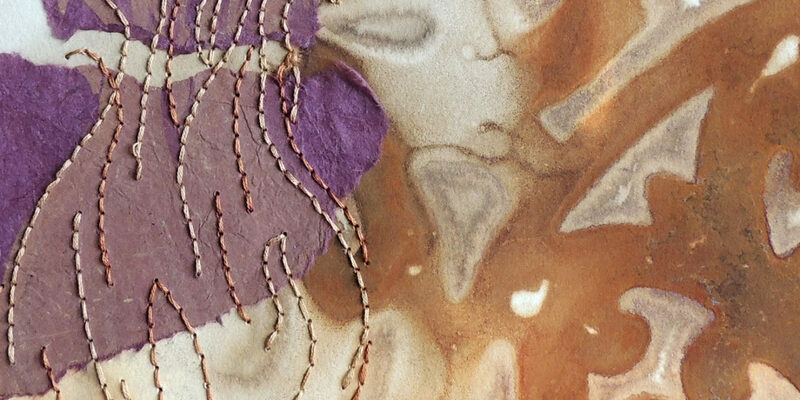 As a sculptor and printmaker, it is challenging at times to find ways to cohesively meld two-dimensional and three-dimensional work without it appearing forced. 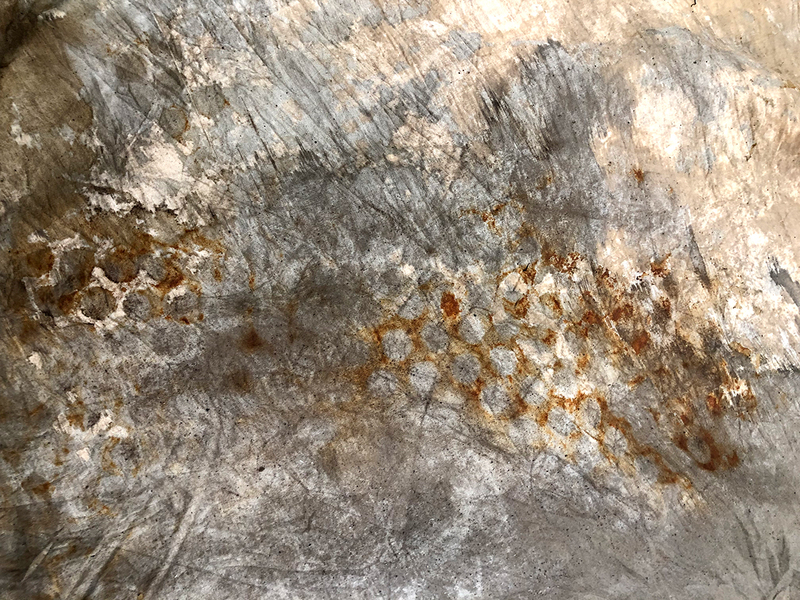 My recent work with rust printing has moved into nonrepresentational mark making to create atmospheric imagery upon paper followed by manipulation of the print with other materials to push them into the three-dimensional realm. CP: Do you think printing with metal and rust results in a feeling of trace/impermanence? Can you talk about the idea of “Traces of Beauty” and what it means to you? 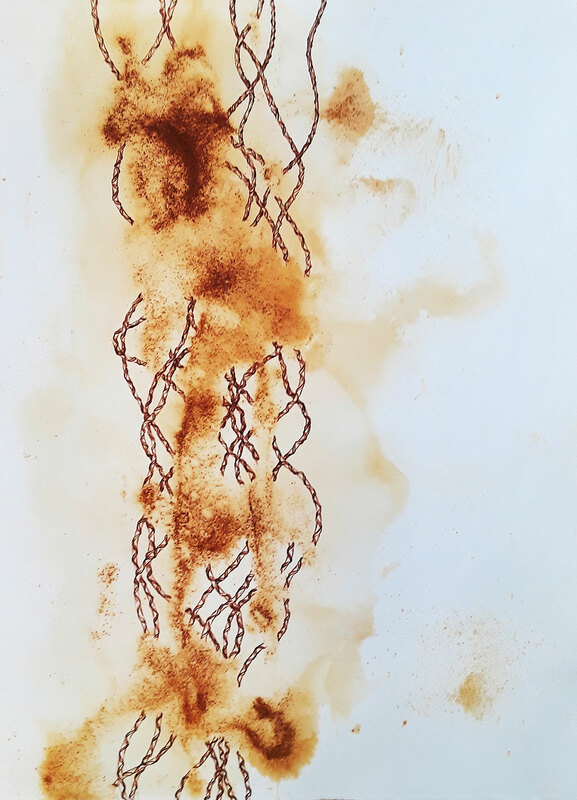 LK: With my rust prints, I strive to be a conduit for the past to speak, as the forms and found objects I use to create my marks are often meant to reference personal and collective memory. I think about the fragile nature and temporality of life… the trace… the influence… the mark that is left by even the smallest action, whether visible or emotional, definitely directs my work a lot. “Traces of Beauty” is about elevating and finding beauty in something that often goes unnoticed or unappreciated. I am drawn to the visual aesthetic and negative space created in decaying architecture. 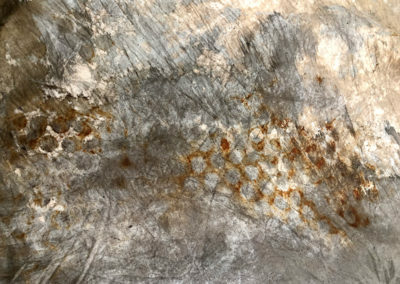 There is a similar quality with rust prints where the full imprint of the metal does not transfer and there is a poetic visual pause created by the negative space leaving the viewer to complete and fill in the space. CP: Who is the ideal student for your upcoming class? Is this a good class for beginners? LK: This is an awesome class for beginners. The ideal student for this class is anyone who likes experimenting and taking chances, as the results are not guaranteed or exact. 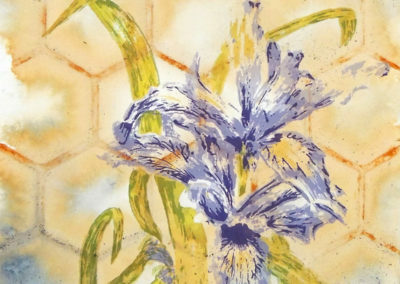 This would be a great class for those looking to add something new to their arsenal of techniques as rust printing lends itself well to book arts, textiles, and creating atmospheric backgrounds for drawings, paintings, and other traditional printmaking. CP: What surfaces can a person print onto? LK: Pretty much anything that encounters a rusty surface will transfer the image. 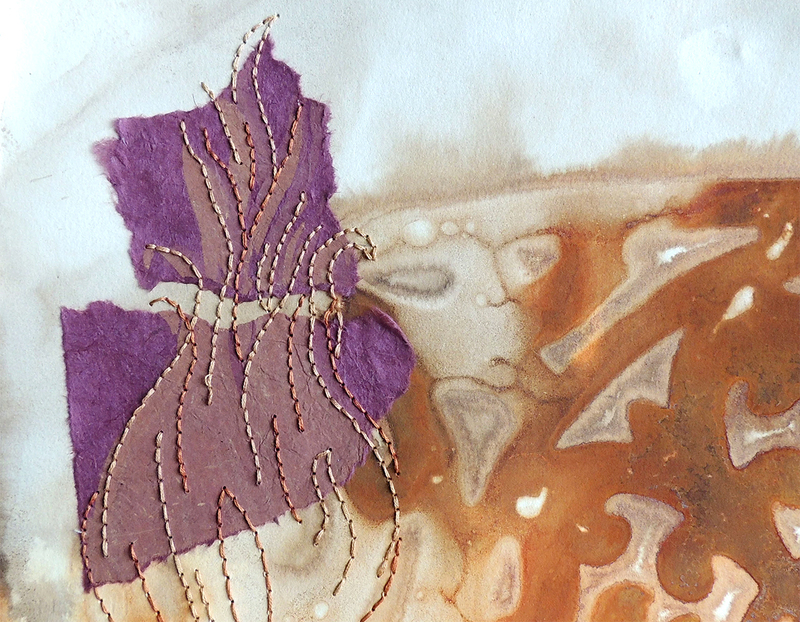 I usually use organic based fabrics and cotton rag papers in my practice because I use natural dyes in addition to the iron oxide. However, plastic and none organic materials also readily accept the transfer of the iron oxide imprints. CP: What are some of your favorite metal objects to print with? LK: Cast iron architectural elements are some of my favorite found objects to print with. Also, the atmospheric effects I can achieve by using the small particles of steel from mill scale and oxy-acetylene discharge have been an interesting addition as the results are uncontrollable. CP: What do you like to create out of metal? Do you ever make custom metal pieces to use in printing? 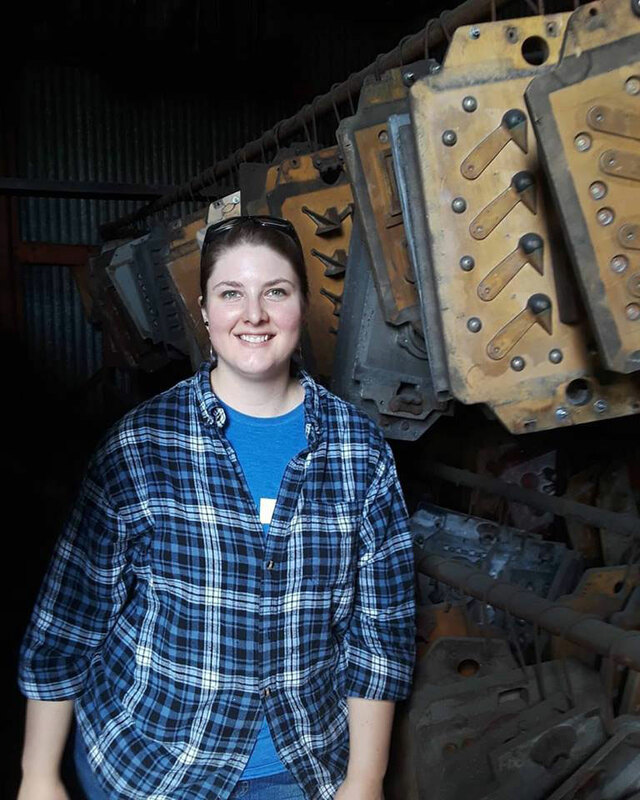 LK: I’ve been iron casting for 18 years in addition to metal smithing, fabricating, and casting other metals for about 10 years. I’m obsessed with everything to do with metal working: the intensity of physical activity, mental concentration, technical skills needed, and even the heat. While I use a lot of found objects for my rust prints, the CNC Plasma cutter is a wonderful invention that lends itself well to cutting customized steel pieces for printing. For some projects, I still prefer to use an analog plasma cutter as I can draw with the plasma cutting torch just like a pencil creating organic lines. The clean lines created by using the computerized CNC plasma cutter can be harsh. CP: Tell me about a piece you have created that has been really meaningful to you. LK: Much of my artwork references my southern heritage and often draws directly my genealogy and personal experiences. I have several mixed media series that deal with a familial narrative and the impact certain family members have had on my life. While all of my artwork is an extension of myself, the emotional connection with these pieces referencing family are extremely strong. CP: What are some of your favorite classes you’ve taken at the Folk School? LK: Ohhhhh… I’ve enjoyed all my classes at the Folk School. I’ve taken mostly music, dance, and metalworking classes. Winter Dance Week is always fun. However, hands down my favorite week to be at the Folk School is Dance Musicians’ Week. Whether I’m working with the four wonderful music instructors, playing music all day for dances, dancing all night, or keeping rhythm on an anvil down in the blacksmith shop working with Greg Price, it’s always a good time. I’ve attended classes that week at least 6 or 7 times, and even if can’t take a class that week, I’ll drive up for a few days to visit all my friends and dance. CP: Which instructor has influenced you the most? LK: I love all of the Dance Musicians’ Week music instructors, but, David Kaynor has become a wonderful mentor and friend over the years. He is a true inspiration. From the first class I took with him, he encouraged me to “OWN” whatever I was doing and for that I am eternally grateful, as that advice has served me well over the past few years. CP: Can you share a favorite place on campus? LK: The gardens are my favorite places on campus, especially early in the morning when the dew is heavy, the sun is just starting to burn off the fog over the hay field, with only the chickens and cats for company. Some of my favorite memories are taking a break from dancing on the back porch of Keith House and watching the sunset cast ever-changing hues upon the mountain range. CP: What instruments do you play? 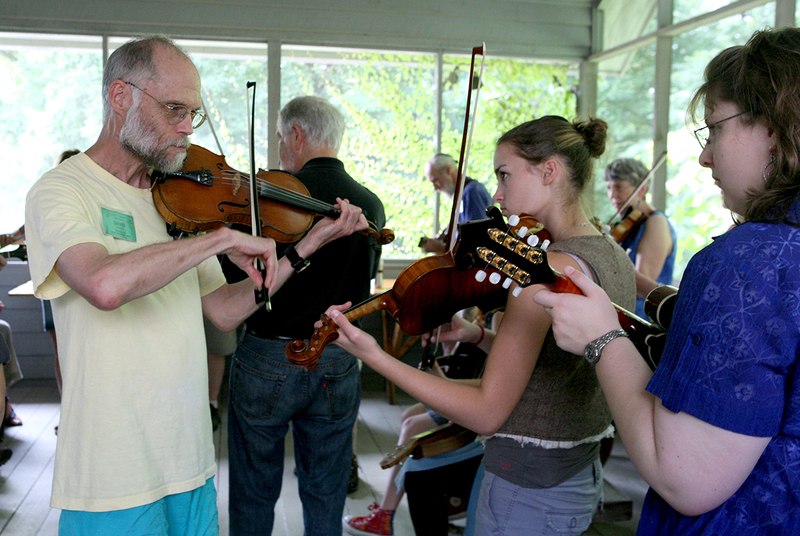 Coming from a classically trained background, what’s is like to learn folk music or play with other folk musicians? LK: I am classically trained in piano and voice, but I have always preferred songwriting and playing folk instruments. Along the way, I’ve picked up guitar, fiddle, mountain and hammered dulcimer, banjo, mandolin, and organ. It has always been hard for me to play by ear, but I can read music very easily, so jumping into jams was very difficult for me when I first started going to dulcimer conferences and the Folk School. I have a deep respect for musicians that play by ear. Classical music is very ‘paint by number’ and doesn’t allow a lot of variation and personality, with folk music that’s a completely different story. CP: If you were a contra or square dance move, what would you be? LK: Let’s just say anything that includes twirling. I’m totally one of those people that adds extra flare to their do-si-dos, balance and swing, half and full hays, and I absolutely hate if I miss a Petronella with the balance, twirl to your right, and clap. It’s so great when you get a really good partner. LK: Learn and travel as much as you can, life is short. 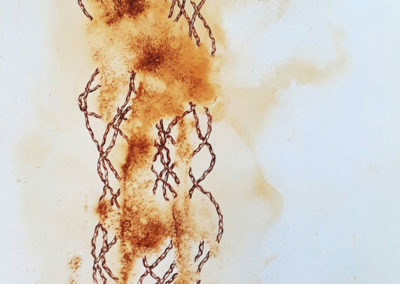 Rust printing is a unique way of mark making that utilizes steel and iron to create images on paper and cloth. 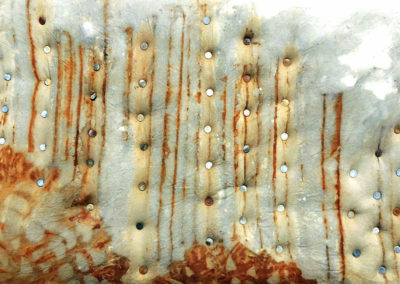 Using found objects to make the marks brings additional pattern and meaning to compositions. 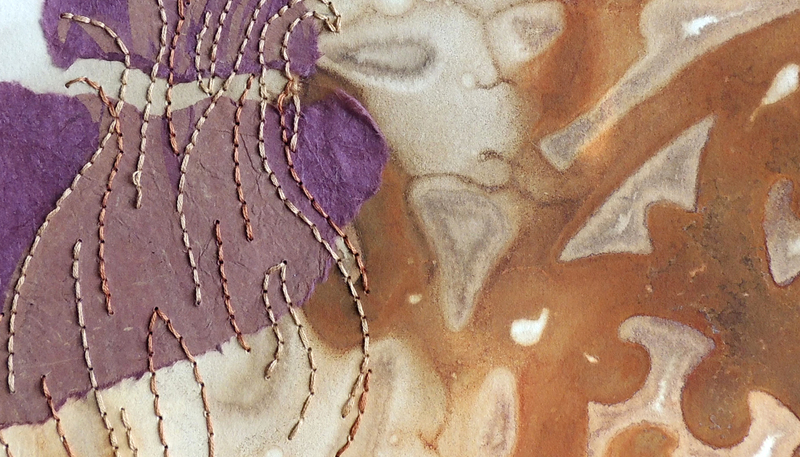 Learn how the natural iron-oxide color of rust can be altered with natural plant colorants, and how the prints themselves can be further altered and used for book making, quilting, and creating mixed-media art. 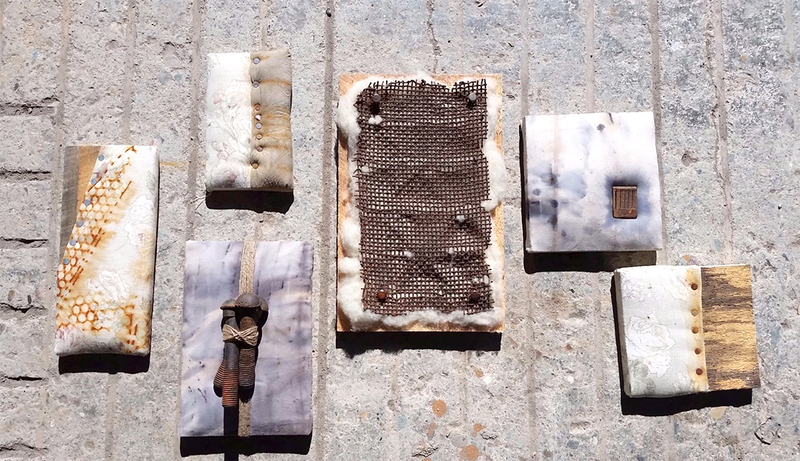 Take away the know-how to set up a mobile, all-weather rust-printing station at home. All levels welcome. Register today! 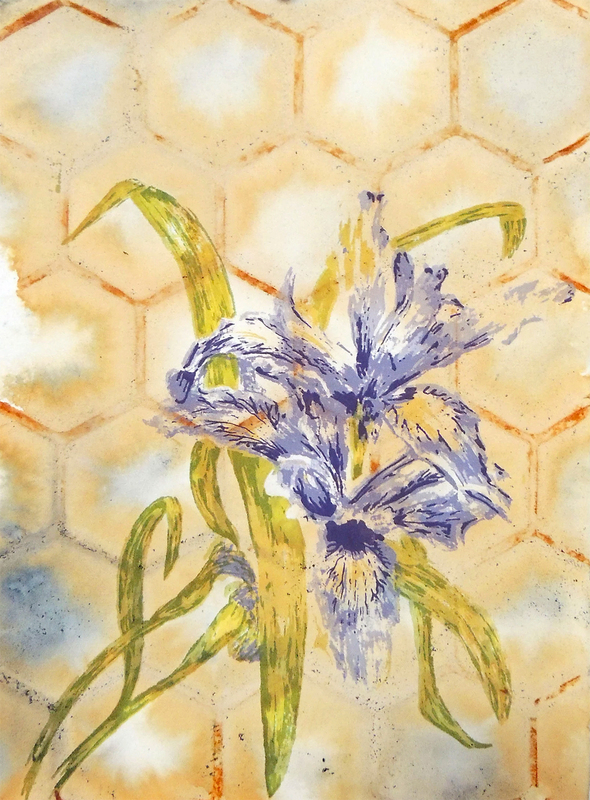 Lauren is an internationally exhibited sculptor and printmaker who also has musical inclinations. 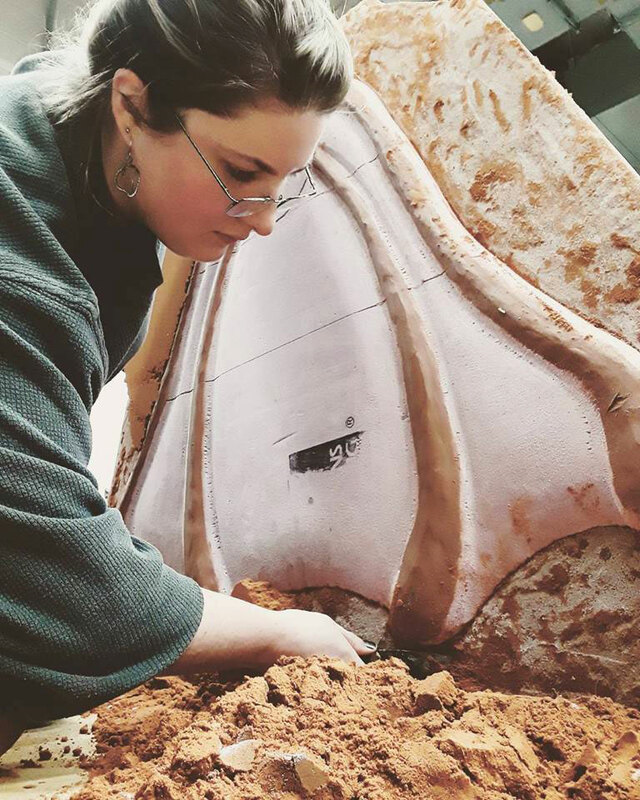 Currently completing her MFA at the University of Maryland, she is originally from Georgia with strong Appalachian roots, and she has been a student at the Folk School since 2006. Lauren’s work is strongly influenced by her Southern heritage and is filled with references to agriculture, industry, and domestic tasks. Follow Lauren’s adventures on Instagram @lace.anvil_lgkart. To learn more about her work, visit Lauren’s website. PreviousWhat Do You Support at the Folk School?